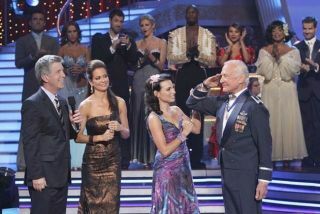 Buzz Aldrin offers a parting salute after being eliminated from ABC's "Dancing with the Stars" on Tuesday, April 6, 2010. Forty years later, Buzz Aldrin is still the secondman out. The second astronaut to walk on the Moon, Aldrin became thesecond celebrity contestant on ABC's tenth season of the reality TVshow "Dancing with the Stars" to be dancedoff the floor. "I did the best I could under the circumstances," admitted Aldrin,80, during Tuesday night's broadcast in reaction to hisdisappointing performance of the waltz on Monday. "I don't feel so good," he said offstage. "I was hoping to domuch better this week." Meeting the judges' challenge to performa dance that tells a story, Aldrin, in his U.S. Air Force "MessDress" uniform including his Presidential Medal of Freedom,performed to the song "What a Wonderful World." "The story is you coming home from war and I am your daughterwaiting for you," explained Ashly Costa, Aldrin's 27-year old dancingpartner. "Our story is a blending together of departing a patriotic duty toa welcoming home with a great optimism for the future," added Aldrinin a taped segment that aired prior to his taking to the floor. Unfortunately, the show's three judges didn't share in the dance'soptimism for Aldrin's future on the show [Aldrinon the moon]. Praising Aldrin's appearance as "royal, dignified... almostmonumental," judge Bruno Toniol ultimately criticized the astronaut'slack of fluidity. "When you started to move, well, it didn'treally go anywhere." Fellow judge Carrie Ann Inaba said she didn't really know if Aldrin's dancinghad improved, but focused her critique on the story thatAldrin and Costa presented. "I believed you completely in therole of the father coming home from war to see his daughter." "It worked in your advantage," she added, "because the older manmight be little stiffer. You did it very, very well." Len Goodman did away with any such pleasantries. "The thing is,we're judging a dancing competition here and the technique was poor,the routine was oversimplified, and there wasn't a lot of performancethere in the dance." For the third straight week, the judges' score put Aldrin at thebottom of the show's leaderboard, earning him just 13 out of a possible 30points. "Buzz did the waltz, he told a really good story but that is aboutall it had to it. The story was charming, the dancing was alarming." Goodman said he was surprised however, that Aldrin was up for elimination. "I am surprised, and I am little bit disappointed because Ithought Buzz, [though] maybe not the judges favorite, but I was sureAmerica was going to save you." Aldrin's fans had successfully rescued theastronaut from being the first to be eliminated by voting for himby phone, text message and online. Their effort was apparently notenough for the second week. Upon hearing he had been eliminated, Costa turned to her dancing partner,hugged him and said "I'm proud of you." The studio audience, including Aldrin's fellow competitors, sharedtheir respect, responding with a standing ovation. "I did this show for the fighter pilots out there, the militarypeople, and the elder geezers like me who would just like to see an eldercome back, week after week," said Aldrin before dancing a finaldance to close out his appearance on the show. "I am interested alsoin having the public be thankful for the successes we had in theApollo program and look forward to even greater successes in our futurespace program." "That's why I came onboard... to take the challenge and take therisk and I thank everyone who voted for us." Host Tom Bergeron concluded the evening by sharing his memoriesof watching Aldrin walk on the Moon. "I never thought I would havethis honor. It has been a pleasure sir to have you on this show," hetold Aldrin. "It has been a wonderful experience for me," replied the astronaut. Visit collectSPACE.com to read about Buzz Aldrin'stime on "Dancing with the Stars" and for the latest episode updatesand photographs.